What are the mutual relationships of blood eosinophils, FENO and serum periostin with sputum eosinophils in a cohort of patients with mild to moderate asthma, and can the findings be replicated in a population with more severe asthma? Previous studies on the diagnostic accuracy of blood eosinophils, FENO and serum periostin to assess eosinophilic airway inflammation have demonstrated conflicting results, and this triad of biomarkers has not been externally validated. This study shows that blood eosinophils is an accurate biomarker for eosinophilic airway inflammation in two independent cohorts of patients with asthma, which can have great practical advantages for guiding current and novel personalised therapies. Asthma is a heterogeneous condition which includes several clinical phenotypes that differ in severity, natural history and responses to therapy.1 There is recent evidence from prospective clinical studies that inflammatory (sub)phenotyping of patients can help to optimise therapy and disease outcome.2 This suggests that biomarkers of inflammation should be considered in identifying patients and monitoring of asthma in clinical practice, such as the titration of steroid treatment. Based on international guidelines on STAndars for the Reporting of Diagnostic accuracy studies, it is mandatory to perform external validation when assessing diagnostic or phenotypical accuracy of disease markers.24 This has not been done for sputum eosinophils with the triad of FENO, blood eosinophils and serum periostin. Therefore, we aimed to quantify the mutual relationships of FENO, blood eosinophils and serum periostin with sputum eosinophils in an external validation cohort of patients with mild to moderate asthma and to replicate findings in a population with more severe asthma. For the external validation cohort, we recruited 200 patients with mild to moderate asthma in the outpatient clinic of the Academic Medical Center (AMC) in Amsterdam and two non-academic pulmonary second-line referral outpatient clinics. For the replication cohort, we recruited 40 patients with moderate to severe asthma in the outpatient clinic of the AMC. For both cohorts, the diagnosis of asthma was defined by a physician's diagnosis of asthma with reversibility in FEV1≥12% of the predicted value and/or airway hyper-responsiveness (PC20 methacholine <8 mg/mL). In the external validation cohort, smokers or ex-smokers with a smoking history >10 pack-years were excluded if they did not show an improvement in FEV1 of at least 12% after inhalation of 400 µg salbutamol with a normal diffusion capacity at the time of inclusion. In the replication cohort, all smokers or ex-smokers with a smoking history >10 pack-years were excluded. At the time of the study visit, no patients had any symptoms of respiratory infection for at least 4 weeks. Both studies were approved by the hospital medical ethics committee, and all patients gave their written informed consent. The external validation cohort was registered in The Netherlands trial register (http://www.trialregister.nl) under NTR1846 and the replication cohort under NTR2364. The studies had similar cross-sectional designs and included one hospital visit for all measurements. During this visit, inclusion and exclusion criteria were examined, lung function was performed and sputum was induced by hypertonic saline. Inflammatory status in the external validation cohort was also measured by the assessment of blood eosinophils, FENO and serum periostin. 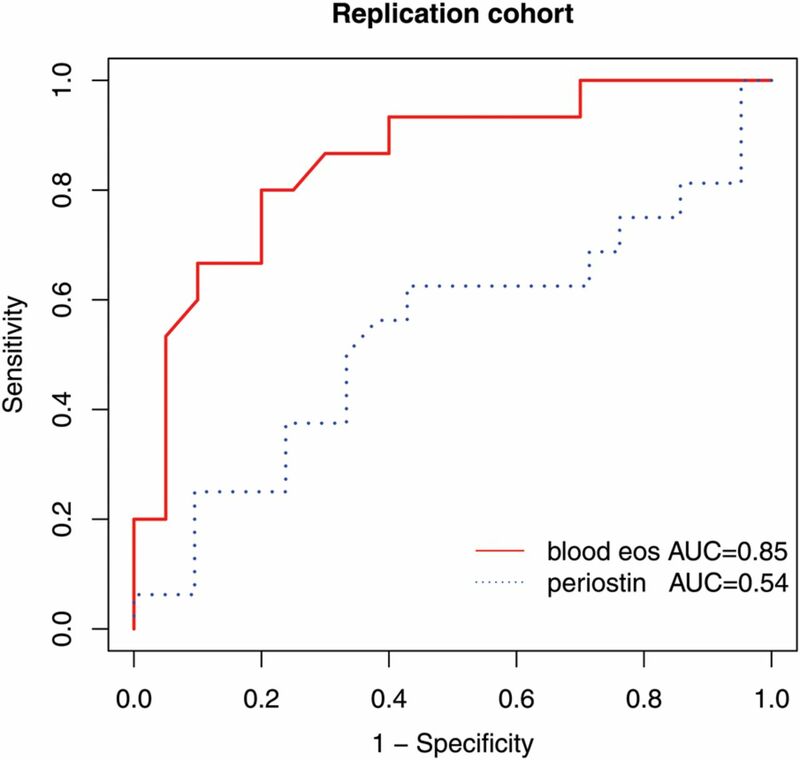 In the replication cohort, blood eosinophils and serum periostin were measured in order to replicate findings in a population with more severe asthma. Lung function was performed according to the European Respiratory Society (ERS) recommendations.25 Atopic status was assessed by total and specific immunoglobulin E (IgE) to a panel of common aeroallergens. Patients were considered atopic if there was at least one serum-specific IgE >0.34 kU/L. SPSS (V.18.0) was used for data analysis. The results for continuous variables were expressed as mean±SD; skewed distributions were presented as medians with IQRs. Non-normally distributed variables were transformed to log or square root values. The relationship between sputum eosinophils and the surrogate markers were analysed using Pearson's correlation coefficient. The diagnostic accuracy of the best predictive marker for sputum eosinophils in the external validation cohort was subsequently verified in the replication cohort using ROC curve analysis. In the external validation cohort (recruitment: June 2009–June 2011) 110 out of 200 patients and in the replication cohort (recruitment: October 2010–June 2011) 37 out of 40 patients were able to produce adequate sputum samples. The patient characteristics of both cohorts are described in table 1, and characteristics stratified by sputum eosinophil counts of ≤3% or ≥3% are presented in online supplementary table E1 in the Online Repository. Blood eosinophils and FENO correlated with sputum eosinophil percentages (r=0.59, p<0.001 and r=0.52, p<0.001, respectively). Using the in-house periostin ELISA, there was no significant correlation between serum periostin and sputum eosinophil percentages (r=0.09, p=0.4). Using the Elecsys Periostin assay, there was a weak but significant correlation between serum periostin and sputum eosinophil percentages (r=0.32, p=0.001). The diagnostic accuracy of blood eosinophils, described as ROC AUC, was 89% (p<0.001, 95% CI 0.81 to 0.96) (figure 1). Using ≥0.27×109/L blood eosinophils as a cut-point, eosinophilic and non-eosinophilic inflammation was well differentiated with a sensitivity of 78% and a specificity of 91% (table 2). Receiver operating characteristics curve analyses of the sensitivity and the specificity of blood eosinophils (eos), FENO and serum periostin (in-house) for the diagnosis of eosinophilic inflammation. AUC, area under the curve. The overall accuracy of FENO levels to differentiate eosinophilic and non-eosinophilic inflammation, described as ROC AUC, was 78% (p<0.001, 95% CI 0.66 to 0.89) (figure 1). This ROC AUC was not significantly different from the ROC AUC of blood eosinophils (p=0.09). A FENO level of ≥42 ppb provided a sensitivity of 63% and a specificity of 92% (table 2). Serum periostin measured by the in-house ELISA was not able to distinguish eosinophilic from non-eosinophilic inflammation (ROC AUC=55%, p=0.44, 95% CI 0.43 to 0.67) (figure 1). Serum periostin analyses using the Elecsys Periostin assay showed similar results (see online supplementary results in the Online Repository). When combining these three variables in the prediction of eosinophilic inflammation, no improvement was seen, resulting in an ROC AUC of 88% (p<0.001, 95% CI 0.79 to 0.97). Next, sensitivity, specificity, PPV and NPV for different criteria used in previous studies are presented in table 2. Since others have reported 2% sputum eosinophils as an alternative criterion for the diagnosis of eosinophilic or non-eosinophilic asthma,8 additional ROC curve analyses were performed using 2% sputum eosinophils as threshold. The results were similar to those using 3% sputum eosinophils, with an ROC AUC of 88% (p<0.001) for blood eosinophils, an ROC AUC of 79% (p<0.001) for FENO and no significant diagnostic accuracy for serum periostin (see online supplementary table E2 in the Online Repository). In the replication cohort as well, there was a significant correlation between blood eosinophils and sputum eosinophil percentages (r=0.80, p<0.001). Blood eosinophil levels were effective in assessing eosinophilic inflammation, with an ROC AUC of 85% (p< 0.001, 95% CI 0.72 to 0.98) (figure 2). Using ≥0.27×109/L blood eosinophils as reported in the external validation cohort as best threshold, the sensitivity was 60% and specificity 90% (see online supplementary table E3 in the Online Repository). In line with the results of the external validation cohort, no correlation was found between serum periostin (using the in-house ELISA) and sputum eosinophils in the replication cohort (r=0.13, p=0.46), nor was periostin able to distinguish eosinophilic inflammation from non-eosinophilic inflammation (ROC AUC 54%, p=0.79, 95% CI 0.34 to 0.74) (figure 2). Independent analysis using the Elecsys Periostin assay provided similar results (see online supplementary results in the Online Repository). Replication of findings: receiver operating characteristics curve analyses of the sensitivity and the specificity of blood eosinophils (eos) and serum periostin (in-house) for the diagnosis of eosinophilic inflammation in a second cohort with more severe asthma. AUC, area under the curve. This study shows that in patients with mild to moderate asthma, blood eosinophils is an accurate surrogate marker for sputum eosinophils. Next, we were able to replicate blood eosinophils as highly effective surrogate markers in a second independent cohort of patients with more severe asthma. FENO was second best, while serum periostin showed the lowest accuracy for eosinophilic asthma in both cohorts. These findings suggest that blood eosinophil count can be used in mild, moderate and severe asthma as an easy-to-measure biomarker for sputum eosinophil percentage, which can have great practical advantages for guiding current or novel anti-inflammatory therapies. Periostin might provide different information than sputum eosinophils, which may be complementary in asthma phenotyping. Interestingly, blood eosinophils and sputum eosinophils were highly correlated in both our cohorts and exhibited the highest diagnostic accuracy which validates previous data,31 ,32 and to a lesser extent a recent report.21 We were not able to show a role for periostin as diagnostic marker for sputum eosinophils in both populations. The present data are not in line with the single previous study investigating the relationship between airway eosinophilia and all three markers, which demonstrated the highest ROC AUC for serum periostin.22 However, the latter study used a combination of both high sputum and high-tissue eosinophils as definition of eosinophilic airway inflammation. Furthermore, they included patients with uncontrolled severe asthma only, whereas the present study included a larger cohort of mild to moderate patients and a somewhat smaller cohort of severe patients. In our study, FENO appeared to be the second-best predictor for eosinophilic inflammation with an ROC AUC 0.78, which is nearly similar to previous studies21 ,22 ,31 although, surprisingly, the best combination of sensitivity and specificity was achieved at a rather high cut-point of 42 ppb in our cohort of patients with mild to moderate disease. 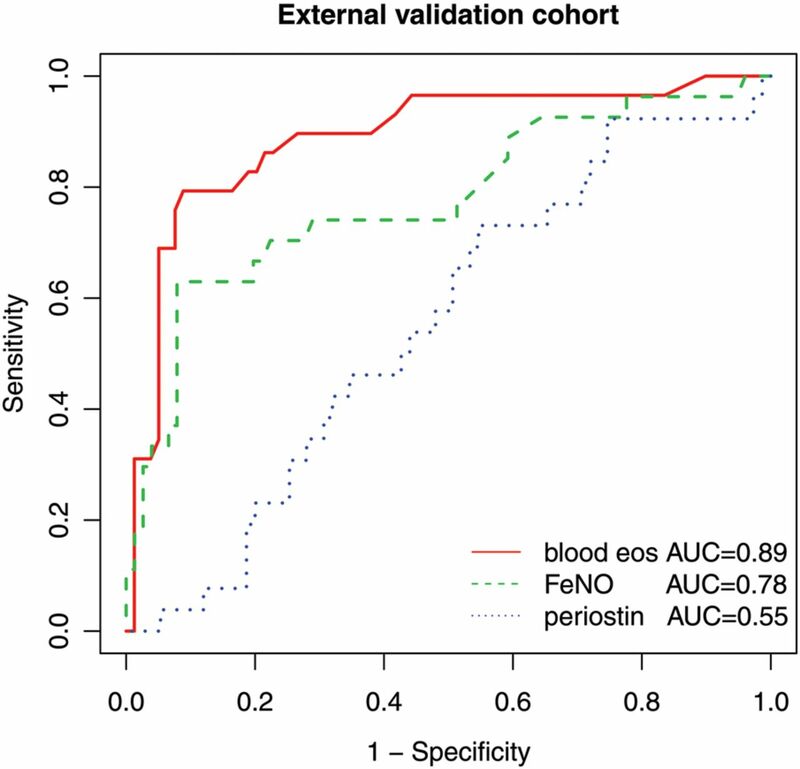 Even though FENO was significantly associated with sputum eosinophils, when combining the three markers in the ROC analysis, neither FENO nor periostin had any additive value. Our data confirms a recent paper in which a weak correlation was found between blood eosinophils and FENO,33 suggesting that blood eosinophils and FENO relate to two different inflammatory pathways. This supports our main result that blood eosinophil count alone is the strongest independent predictor for eosinophilic airway inflammation. To the best of our knowledge, this is the first study to externally validate serum periostin as surrogate marker for sputum eosinophils in a population with mild to moderate asthma, including replication in a second cohort with more severe disease. We believe that the strength of this study is that we have two independent well-characterised cohorts of varying asthma severity and treatment, though with similar stringent criteria for the diagnosis of asthma. Another strength is the size of the external validation cohort, which reassures the confidence of the analysis. However, the size of the replication cohort of patients with severe asthma was limited, which may require further analysis in large severe asthma cohorts, such as U-BIOPRED (Unbiased BIOmarkers in PREDiction of respiratory disease outcomes). The predictive accuracy of blood eosinophils is unlikely to be affected by treatment in our cohorts, since we recruited widely varying levels of therapy in mild, moderate and severe patients, including 19% of the severe patients using oral corticosteroids. Next, the sputum from both cohorts was processed in different standardised ways (whole sample vs selected plug). Nevertheless, the correlation with blood eosinophils was consistent, which may be due to careful quality control procedures. We used 3% sputum eosinophils as the threshold for eosinophilic or non-eosinophilic airway inflammation according to the literature. Because others have used 2% as the cut-point, we reanalysed the data with 2% blood eosinophils as threshold showing similar results. Finally, we used two independent periostin assays, thereby contributing to the validity of our data. One of the potential weaknesses of our study is that we could not obtain adequate sputum in all patients. However, no significant differences were found in blood eosinophil counts and FENO level between the patients who successfully produced sputum and those who did not (data not shown). Therefore, we do not believe that the results of our study are biased by this limitation. Furthermore, the smoking status between the cohorts differed, as ex-smokers were included in the validation cohort and excluded in the replication cohort. In the validation cohort, patients with a smoking history, as compared with never-smokers, had borderline significantly higher sputum eosinophils (p=0.05), whereas no differences were found for blood or sputum neutrophils, blood eosinophils, FENO and periostin (p=0.26, p=0.09, p=0.46, p=0.25, p=0.31, respectively). As a result, smoking status does not seem to have affected our results. Finally, we used a different assay to measure serum periostin as compared with previous studies. Our in-house ELISA for periostin was validated as described in the Online Repository. It has been argued that some antiperiostin antibodies may not recognise all four isoforms of periostin in serum.22 ,34 Since it is unknown which isoforms are present in serum, we have extensively, but unsuccessfully attempted to determine which isoforms of periostin were present in (up to 10-fold concentrated) serum using western blotting with a goat polyclonal antibody (R&D; AF3548) affinity-purified on periostin (Asn22-Gln836; data not shown). Given that the amounts of periostin in serum reported here were similar to those reported by others,22 ,30 we consider it highly unlikely that our in-house ELISA failed to recognise the most abundant splice variants of periostin in serum. Moreover, the additional analyses by the Elecsys Periostin assay with antibodies aimed to recognise all known splice variants that showed similar results. The correlation between blood and sputum eosinophils in asthma may not be biologically surprising. Eosinophils are produced in the bone marrow, and in case of inflammation, the formation is amplified and the eosinophils traffic into inflammatory sites, all under influence of a number of cytokines, such as interleukin (IL)-5.35 Blood eosinophils of patients with asthma have a distinct phenotype, especially in relation to their adhesive properties,36 which is involved in the transmigration across endothelium and epithelium. Increased eosinophils were observed in both the blood and sputum after allergen challenge.37 Furthermore, several studies have demonstrated that the infusion of anti-IL-5 intravenously dramatically lowers eosinophil levels in both the blood and sputum or in bronchoalveolar lavage fluid.18–20 ,38–41 Hence, although the transport of eosinophils from the blood into the lung is a complex active process, in a chronic inflammatory disease such as asthma, the levels of eosinophils in the blood and sputum appear to be closely related. What are the clinical implications of our study? Since the measurement of blood eosinophils is easy and quick in comparison with sputum eosinophils, our data support the opportunity to assess the presence or absence of eosinophilic airway inflammation and monitor treatment in asthma. This is supported by two very recent trials using anti-IL-5 (mepolizumab), resulting in a significant reduction in the daily requirement of oral glucocorticoid therapy, reducing exacerbations and improving asthma symptoms of patients with severe eosinophilic asthma, identified by a blood eosinophil count of ≥300 cells/µL during the year before screening or ≥150 cells/µL before randomisation.19 ,20 Additionally, in a large study using anti-IL-5 to target eosinophilic airway inflammation in patients with severe asthma, blood eosinophil count at baseline was predictive for the efficacy of reducing exacerbations.18 A follow-up analysis of this study showed that blood eosinophil count in the placebo cohort was stable over time.42 Furthermore, several studies showed that anti-IL-5 treatment results in a significant decrease in both sputum and blood eosinophil counts, but not in FENO,18 ,40 confirming the relevance of blood eosinophils in stratification studies for anti-IL-5. With regard to anti-IL-13 therapy, blood eosinophils were not successful in the stratification of patients responsive to treatment.43 However, the latter study used a much lower cut-point for blood eosinophils (≥0.14×109/L) as compared with our study, and used a combination of serum IgE and blood eosinophil counts to identify an IL-13 signature surrogate. A more recent study on anti-IL-4/IL-13, using a higher cut-point for blood eosinophils for the stratification of patients (≥0.30×109/L), did show significant improvements after treatment, thereby supporting blood eosinophil count as biomarker.44 Obviously, this needs replication. In conclusion, we showed a meaningful relationship between blood eosinophils and sputum eosinophils in two independent cohorts with varying asthma severity. FENO was a second-best predictor for eosinophilic airway inflammation, though FENO did not demonstrate additive value to blood eosinophils. Serum periostin was not related to sputum eosinophils in mild to moderate asthma, and this finding was replicated in the population with more severe disease. This suggests that periostin might capture other asthma phenotypes than those represented by sputum eosinophils per se. Our data indicate that blood eosinophils represent an accurate biomarker for sputum eosinophils in asthma, which can facilitate effective guidance of individualised asthma treatment. We would like to acknowledge Barbara Smids, Tamara Dekker, Dr Marianne van de Pol and Annemiek Dijkhuis for their professional technical handling of the sputum, performing differential cell counts, measuring periostin and validating the periostin assay. Furthermore, we would like to acknowledge Dr Stewart Bates from Discovery Technologies at GlaxoSmithKline for technical advice on the periostin measurements and validation. Finally, we would like to acknowledge Dr Cecile Holweg and colleagues from Genentech, a member of the Roche Group, for the collaboration and prompt facilitation of serum periostin analyses with the Elecsys Periostin assay developed by Roche Professional Diagnostics.
. Clinical phenotypes of asthma. Curr Opin Pulm Med 2004;10:44–50.
. A systematic review and meta-analysis: tailoring asthma treatment on eosinophilic markers (exhaled nitric oxide or sputum eosinophils). Thorax 2012;67:199–208.
. Non-eosinophilic corticosteroid unresponsive asthma. Lancet 1999;353:2213–14.
. Sputum eosinophil counts predict asthma control after discontinuation of inhaled corticosteroids. J Allergy Clin Immunol 2005;115:720–7.
. Standardised methodology of sputum induction and processing. Eur Respir J 2002;20(Suppl 37):1s–2s.
. Sputum induction in severe asthma by a standardized protocol: predictors of excessive bronchoconstriction. Am J Respir Crit Care Med 2001;164:749–53.
. The use of exhaled nitric oxide concentration to identify eosinophilic airway inflammation: an observational study in adults with asthma. Clin Exp Allergy 2005;35:1175–9.
. Nitric oxide in exhaled breath is poorly correlated to sputum eosinophils in patients with prednisone-dependent asthma. J Allergy Clin Immunol 2010;126:404–6.
. Distribution of sputum cellular phenotype in a large asthma cohort: predicting factors for eosinophilic vs neutrophilic inflammation. BMC Pulm Med 2013;13:11.
. Eosinophilic inflammation in asthma. N Engl J Med 1990;323:1033–9.
. Heterogeneity of asthma according to blood inflammatory patterns. Thorax 2009;64:374–80.
. Blood eosinophils to direct corticosteroid treatment of exacerbations of chronic obstructive pulmonary disease: a randomized placebo-controlled trial. Am J Respir Crit Care Med 2012;186:48–55.
. Oral glucocorticoid-sparing effect of mepolizumab in eosinophilic asthma. N Engl J Med 2014;371:1189–97.
. Mepolizumab treatment in patients with severe eosinophilic asthma. N Engl J Med 2014;371:1198–207.
. Biomarker surrogates do not accurately predict sputum eosinophil and neutrophil percentages in asthmatic subjects. J Allergy Clin Immunol 2013;132:72–80.
. Periostin is a systemic biomarker of eosinophilic airway inflammation in asthmatic patients. J Allergy Clin Immunol 2012;130:647–54.
. Genome-wide profiling identifies epithelial cell genes associated with asthma and with treatment response to corticosteroids. Proc Natl Acad Sci USA 2007;104:15858–63.
. The STARD statement for reporting studies of diagnostic accuracy: explanation and elaboration. Ann Intern Med 2003;138:W1–12.
. Sputum induction. Eur Respir J 2002;20(Suppl 37):3s–8s.
. Exhaled nitric oxide levels and blood eosinophil counts independently associate with wheeze and asthma events in National Health and Nutrition Examination Survey subjects. J Allergy Clin Immunol 2013;132:821–7.
. Cooperation between interleukin-5 and the chemokine eotaxin to induce eosinophil accumulation in vivo. J Exp Med 1995;182:1169–74.
. Dissection of the hyperadhesive phenotype of airway eosinophils in asthma. Am J Respir Cell Mol Biol 2006;35:378–86.
. Magnitude of late asthmatic response to allergen in relation to baseline and allergen-induced sputum eosinophilia in mild asthmatic patients. Ann Allergy Asthma Immunol 2008;100:457–62.
. Eosinophil's role remains uncertain as anti-interleukin-5 only partially depletes numbers in asthmatic airway. Am J Respir Crit Care Med 2003;167:199–204.
. Effects of an interleukin-5 blocking monoclonal antibody on eosinophils, airway hyper-responsiveness, and the late asthmatic response. Lancet 2000;356:2144–8.
. Blood eosinophil count is a useful biomarker to identify patients with severe eosinophilic asthma. Ann Am Thorac Soc 2014;11:531–6.
. Dupilumab in persistent asthma with elevated eosinophil levels. N Engl J Med 2013;368:2455–66. AHW and SBdN contributed equally. Collaborators Barbara Smids, Tamara Dekker, Marianne van de Pol, Annemiek Dijkhuis, Stewart Bates, Cecile Holweg. Contributors AHW and SBdN collected and analysed the data, and wrote the paper. RL, ARS, EJMW, EHB and PJS were responsible for the design of the study and revised the article critically. All approved this version to be published. Funding This study was an investigator initiated study, financially supported by two unrestricted grants from GlaxoSmithKline and supported by Genentech, a member of the Roche Group. Competing interests All authors state that competing interests do not exist for this manuscript. Ethics approval Medical Ethics Committee from the Academic Medical Center in Amsterdam.